A heated debate has raged since 1970 concerning di-nosaurian physiology. Ever since dinosaur palaeobiolo-gists realized that many dinosaurs were active animals (e.g. Ostrom, 1969; Galton, 1970a, b), the question has continued to resurface. Bakker (1972,1986) in particular argued that all dinosaurs were fully warm-blooded, just like living birds and mammals, and that this explains their success. His claim was that the dinosaurs were endotherms, animals that control their body temperature internally, rather than ectotherms, which rely only on external sources of heat. Additional lines of evidence have been brought to bear, and the debate continues. Finds of dinosaurs within the Cretaceous polar regions (Figure 8.20) have been thought to indicate en-dothermy, because a typical reptile could not survive in cold polar conditions. Polar dinosaurs were found first in Alaska in the 1960s, and further collecting has revealed a restricted fauna dominated by hadrosaurs, with rarer ceratopsians and isolated remains of a troodontid and a tyrannosaurid (Clemens and Nelms, 1993). 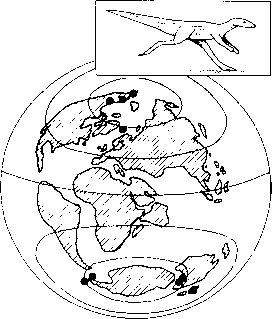 Several localities in the Lower Cretaceous of Victoria, south Australia, a region that was located well within the Antarctic Circle at the time, have yielded dinosaur finds (Rich et al., 1988): hypsilophodontids, an allosaurid, crocodilians, pterosaurs, turtles, amphibians and fishes. There is geological evidence for winter freezing in South Australia, and that would be expected —even in the absence of a permanent ice-cap, polar regions receive very little sunlight in winter. Did the Alaskan and South Australian dinosaurs live in the ice and snow? Seebacher (2003) has shown that ectothermic dinosaurs of all body sizes could have maintained body temperatures of 30°C or above, up to latitude 55-55°, even in the winter. North and south of that latitude, winter body temperatures of ectothermic dinosaurs would fall below 30°C. The dinosaurs of Alaska and Australia probably migrated away to avoid the months of darkness and absence of plant food, so polar dinosaurs do not prove endothermy. Permian to 10% in the Late Permian, and to 2-3% in Late Triassic, Jurassic and Cretaceous dinosaur faunas. He interpreted this as strong evidence for dinosaur en-dothermy. There are many practical problems in calculating such ratios, and the ratios for large ectothermic predators closely approach those for endothermic predators. The ratios seem to vary with the size of the animals involved rather than simply with their ther-moregulatory state. Dinosaurs had an erect stance and advanced gait compared with most of their predecessors (see Box 6.2). Among living animals, only endotherms (birds, mammals) have erect gait, and Bakker (1972) suggested that this, and the supposed ability of dinosaurs to achieve fast speeds, indicated endothermy. There is, however, no demonstrated causal link between endothermy and erect gait and the data on dinosaur running speeds are also equivocal. Estimates of speeds, based on fossilized trackways and limb dimensions, range from 6 to 60kmh-1 (1.5-7ms-1: Alexander, 1976; Thulborn, 1990). But only small bipedal dinosaurs could achieve the higher speeds of 35-60 kmh-1, and 40kmh-1 may be a more likely maximum. Larger dinosaurs were probably restricted to walking or slow trotting gaits and speeds of 10-20kmh-1. The long-necked sauropods must have had problems in pumping blood up their necks to supply the brain and face. It has been suggested that these dinosaurs probably had to have a powerful four-chambered heart, a feature seen only in living birds and mammals, and that dinosaurs were thus endothermic. This correlation is uncertain, however, not least because crocodilians have a four-chambered heart. ever, can occur in modern ectothermic reptiles, as well as in endotherms (Reid, 1997), and many small mammals and birds have no Haversian systems, despite having the highest metabolic rates found in endotherms. A second histological argument for dinosaurian en-dothermy is based on the presence of fibrolamellar bone in many dinosaurs (Figure 8.21(b)). This is a type of primary compact bone that grows quickly, without formation of growth rings, and it is now found in large fast-growing mammals (e.g. cattle) and some birds (e.g. ostriches). Fibrolamellar bone implies only fast growth rates and not necessarily endothermy, so the dinosaurs that have it grew fast to reach sexual maturity (see Box 8.6). 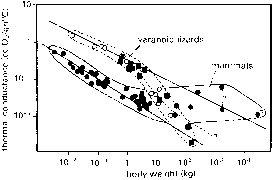 Modern reptiles have lamellar-zonal bone, which grows slowly and often intermittently, producing growth rings, or lines of arrested growth, when food supplies are limited or climates are unfavourable. Lines of arrested growth are known to be annual in, for example, crocodilians. Lamellar-zonal bone (Figure 8.21(c)) has been reported in many dinosaur groups (Reid, 1997), so a mixed thermoregulatory regime is suggested with a combination of fast and episodic growth rates. Modern reptiles typically grow slowly, whereas en-dotherms can grow fast—an ostrich or a whale reaches adult size in five to ten years. Studies of dinosaurian bone show that dinosaurs were fast growers (Padian et al., 2001b), reaching adult size in only a few years (see Box 8.6). Even the large sauropods grew at rates more equivalent to whales than to crocodilians (Erickson et al., 2001), reaching adult size in 10-15 years, rather than 100. Such fast growth in dinosaurs has been assumed to imply endothermy, but inertial homeothermy (see below) cannot be ruled out (See-bacher,2003). When Bakker (1972, 1986) suggested that some dinosaurs might have had feathers, he was ridiculed. New finds from China, however, have shown that coelurosaurs had simple filament-like feathers and maniraptorans had true contour feathers (see Box 8.2). These theropods presumably evolved their first simple feathers for insulation and this implies a measure of endothermy. Barrick and Showers (1994) tested for differences between core and peripheral body temperatures in Tyran-nosaurus, a seemingly impossible task without a time machine, a large thermometer and a certain amount of foolhardiness! They measured oxygen isotopes in core bones (ribs and dorsal vertebrae) and peripheral bones (limbs and tail) to assess temperatures, on the assumption that the ratio of 18O/16O in the apatite would have been fixed at the time of bone formation. They found evidence that body temperatures were 4°C higher in the core elements than the peripheral and they argued that this proved constancy of body temperature, and hence endothermy. Critics have noted that the data could have been over-interpreted (Reid, 1997), and the implied constancy of body temperature could in fact be achieved by inertial homeothermy (see below). The idea has been extended by a comparison of the oxygen isotope ratios in the enamel of crocodilian and theropod teeth from four Late Cretaceous localities, ranging from equatorial to temperate zones (Fricke and Rogers, 2000): the crocodilians showed changes in the ratio of 18O/16O that match modern ectotherms, whereas the theropod figures were those of endotherms. Birds and mammals have complex scrolls of thin bone within the nasal cavity, termed turbinates. These are covered with mucous membranes in life and their function is to conserve water by extracting it from respiratory air before it is exhaled. Modern ectotherms lack turbinates and so too did dinosaurs (Ruben, 1995), evidence perhaps against endothermy. Dinosaurs laid eggs (Carpenter et al, 1994; Horner, 2000), and most laid them in nest-like structures that were dug in the sand or earth (illustration (a)) and then covered over for incubation, as in present-day crocodilians. In many cases, the eggs are long and ellipsoid in shape and they were laid in concentric circles, upright and with the narrow end downwards. On hatching, the young left through the top of the eggs, leaving the lower halves intact within the sediment. Some finds indicate brooding; an adult Oviraptor, perhaps a bird in any case (see p. 275), seated on a nest of unhatched eggs (Norell et al., 1995). But what happened after the babies hatched? Among modern reptiles and birds, many are precocial, meaning they get up and run immediately. Others, are altricial, meaning that the young stay in the nest and have to be cared for. A strong case was made for altriciality in dinosaurs. Excavations of Late Cretaceous nests of the hadrosaur Maiasaura (Horner and Makela, 1979) revealed skeletons of 15 juveniles, each about 1 m long, around a nest mound that contained egg fragments. Perhaps they stayed together for some time after hatching. 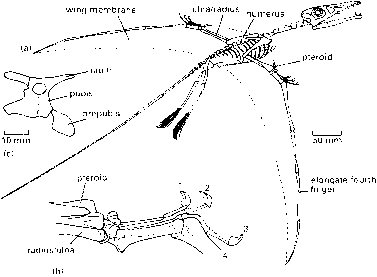 This view was criticized by Geist and Jones (1996) who reported precocial features in Maiasaura; the pelvic bones and limb bones are complete and well ossified, suggesting that the babies were ready to jump up and run off as soon as they hatched. Horner (2000) made a case for site fidelity, based on ten nests at different stratigraphic levels at the same site in Montana. Sander etal. (1998) report some 90,000 egg clutches at a single large site in the Upper Cretaceous of northern Spain, accumulated over a time span of some 10,000 years, again suggesting that the dinosaurs returned repeatedly to lay their eggs in the same area. Some of the unhatched eggs from these sites have been dissected to reveal the tiny bones of embryonic dinosaurs (Horner and Weishampel, 1988). The troodontid embryo just before hatching (illustration (b)) would have been about 0.2 m long, and adults reached lengths of 2.5 m.
Juvenile dinosaurs have big heads, short necks and big feet, and the proportions change in a fairly regular way. 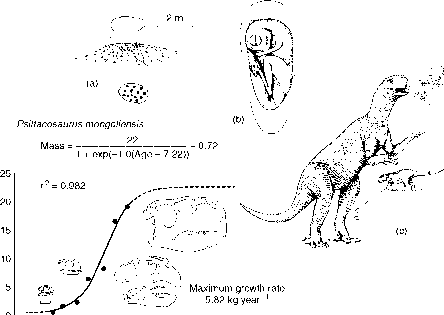 One of the smallest baby dinosaurs, a young Psittacosaurus (Coombs, 1982), is about 0.24 m long, compared with an adult length of 2 m (illustration (c)). A sequence of juvenile to adult skulls (illustration (d)) shows how the proportions changed and the especially characteristic ceratopsian features—the beak, high snout, small orbit, large lower temporal fenestra—progressively developed. A key question concerns growth rates. If large dinosaurs grew at the rates of many modern reptiles, they might have taken 100 years or more to reach sexual maturity. It seems that dinosaurs grew faster, based on counts of growth rings and comparisons of juvenile and adult specimens (Erickson et al., 2001). Small theropods took only two to four years to reach maturity, medium-sized dinosaurs such as Maiasaura and Psittacosaurus, took five to ten years (illustration (d)), and sauropods such as Apatosaurus took 15 years. So, a 25-tonne Apatosaurus added some 14.5 kg per day to its body mass, comparable to the fast growth rates of modern whales (21 kg per day). The growth curves are sigmoid (S-shaped), with an exponential (accelerating) early phase, and then a slowing down. Read more about dinosaur eggs and embryos at http://www.nationalgeographic.com/features/96/dinoeggs/, and about Jack Horner and his research at http://museum.montana.edu/ and http://www.prehistoricplanet.com/features/articles/ jack_horner.htm. dinosaurs were full-blown endotherms, but equally it is wrong to say that they were all ectotherms like modern lizards and crocodilians. There are two major groups of dinosaurs for which different physiologies may have applied: small and large forms. Many small dinosaurs may indeed have been en-dotherms. Some, such as Hypsilophodon, are known to have had fibrolamellar bone, which has generally been interpreted as an indicator of sustained high growth rates (see Box 8.6). The feathered coelurosaurs must also have had some degree of endothermy, whether they maintained their body temperatures at the same high levels as birds today or, more probably, at a lower level. becomes equivalent to that of mammals (Figure 8.22). By extrapolation, the body temperatures of medium- to large-sized dinosaurs living in similar climatic conditions would have remained constant to within 1 or 2°C inertially without internal heat production. Are amphibians endothermic or ectothermic? How many dinosaurs were like amphibians?